What the books about: Skip the hassle of last-minute meals and leftovers and replace them with simple, healthy, delicious, and easy-to-prepare make-ahead dishes! Your family will love these comfortable meals, new favorites, cozy drinks, and tantalizing desserts–all of them prepared ahead of time so you don’t have to worry! Enjoy simple, soul-filling foods without the chaos of preparing them at the last minute. 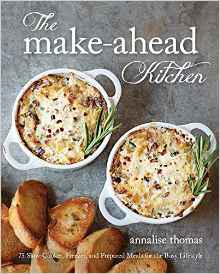 My review: I was given a copy of “The Make-ahead Kitchen” by Annalise Thomas in exchange for an honest review. I love cookbooks and was thrilled to get a copy of this one. Recently I have been doing some freezer meals and trying to save some prep and cooking time. This cookbook fit the bill. Though it isn’t all freezer meals that you put in a bag and pull out later, there are recipes that freeze well, some you make the night before, and some that are just plain time saving. The recipes are easy to follow, the ingredients are normal pantry items, and the pictures are enticing. The author gives her tricks of the trade and even explains her measuring methods. Annalise spends her time in the kitchen and exploring the beautiful Olympic Peninsula of Washington, where she lives, with her family. If you want to find her, look in her kitchen, or at one of the many beautiful beaches nearby watching her children play and combing for beach glass!